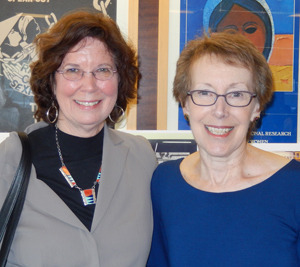 Now for the sixth installment of our seven part series on the 2013 Jane Addams Children’s Book Award Ceremony. Below you will find the introduction given by Lani Gerson for We’ve Got a Job: The 1963 Birmingham Children’s March by Cynthia Levinson. Adults are always telling young people that they can grow up to make a difference; that they should prepare themselves for an uncertain future by getting smarter, more skilled and better prepared to become accomplished agents for change. Cynthia Levinson has written a wonderful book that tells the stories of how young people in Birmingham, Alabama during the crucial months of 1963 become their own heroes right then and there. While adults in the civil rights movement struggled to find the way forward in their efforts to bring about freedom and integration in Birmingham, young people, children really, stepped into the worrisome void and made history. In this time of many significant anniversaries, the complex and inspiring actions of Birmingham’s black youngsters, culminating in the Children’s March, marks its 50th, and today we honor that history, the history makers and the history writers of that time period. You know a book of history is successful when people like Audrey, Wash, James and Arnetta, the guides chosen to tell this story, breathe. You know a book of history is worthy of the events it describes when they come alive again and remain relevant for today. You know you have a winner of a book when tears flow from the eyes of the reader. 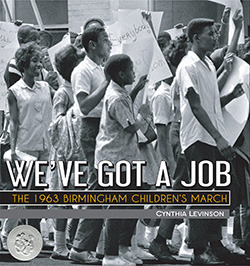 Thank you, Cynthia Levinson, for writing such a fine book, We’ve Got A Job: The 1963 Birmingham Children’s March, published by Peachtree Publishers in Atlanta. Ms. Levinson, you are a thorough researcher, a compelling writer, and, I dare say, an empathetic interviewer. It is my honor and pleasure to introduce you as the winning author of this year’s Jane Addams Children’s Book Award for older children.